There are lots on applications for this word. One basic meaning. See the dictionary. In work, at home, in communication, in relationships, in the pace we live our day-to-day. You need slack in the mix occasionally to keep things in balance. You need to give it to others, and yourself from time to time. It’s a necessary mechanism for successful living and doing. An important caution: Don’t make a habit of expecting it. That approach will dull your blade, slow your game. Better to stay sharp, ready to take actions as needed. But on the whole, slack is necessary. It’s the counterbalance to constant tension, it provides some respite, an opportunity to recharge. Sometimes slack means forgiveness. I’m into that. But give it too often or more accurately, too fast, and accountability suffers. You lose the sense of quid pro quo – I’ll trade “this for that”, what’s fair is fair. What does that mean? In other words, give a little slack ( a little forgiveness), to get a little more (effort, time, commitment, etc.) next time. But if it doesn’t play that way, if someone takes more than they give, that can cause problems. 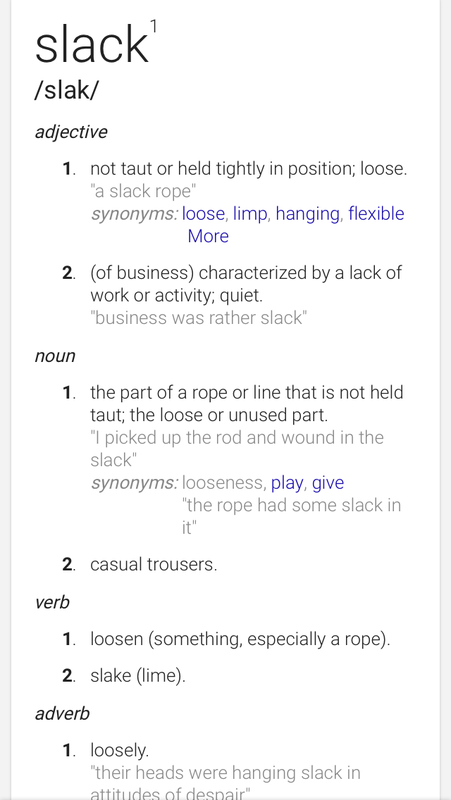 There’s a reason that phrase is in Latin – it’s a concept humans have struggled with for millennia: when to tighten up, when to hold out, when to give slack. Like lots of people, I find the struggle in trying to balance when to hold tight, when to let up. It’s a life-long lesson. It applies in so many facets of our lives: study, relationships, work, exercise, and on and on. When to keep it tight, when to give some slack. It’s a life-long lesson for sure. Learn it. Keep refining your application of the practice.